There’s an ingredient in our food that scientists are beginning to suspect could be a cause of auto-immune disorders such as multiple sclerosis and Grave’s disease. Excitotoxins – amino acids that, quite literally, excite the nervous system, and cause neurological damage – may be a bigger culprit than anyone has suspected, and often they’re a hidden ingredient in the food we eat. 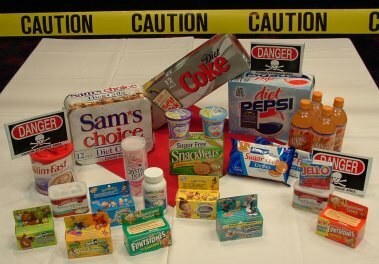 The two most common excitotoxins are the artificial sweeteners monosodium glutamate (MSG) and aspartame, but they are also hidden behind ingredients such as hydrolyzed proteins, hydrolyzed oat flour, sodium caseinate, calcium caseinate and yeast extract. Soybean extract are also rich in glutamate. Researchers such as neurosurgeon Russell Blaylock and others have suspected for a long time that excitotoxins can cause auto-immune disease, and their concerns have recently been supported by a study from the Albert Einstein College of Medicine in New York. (Source: Townsend Letter, 2008; 304: 28-29). Links added. Online here. This is the first time that I’ve actually been immediately convinced of the likely truth of a statement regarding what might cause MS.
See, from the time I was old enough to drink from a sippy cup, I’m pretty sure I’ve drunk more sugar-free Kool-Aid, diet sodas, and iced tea sweetened with Equal than, well, anything else besides water. I’ve eaten “diet” foods that were rich in artificial flavors which still didn’t always make the diet-food-of-the-day taste good, since I was 8, and those foods have so many of those excitotoxins. If consuming these low-calorie, low-fat foods and drinks to have a healthier life leads to multiple sclerosis, I promise the irony is NOT be lost on me.